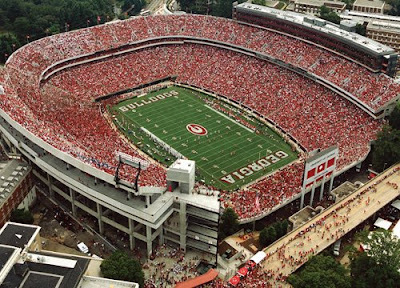 The University of Georgia ranked 6th nationally in attendance for the 2008 college football season, drawing a Sanford Stadium capacity of 92,746 per contest. Michigan, Penn State, Ohio State, Tennessee, and Texas made up the top 5 schools in average attendance. The only way UGA can move up this list is by stadium expansion. There are some long-range plans in this area, but there will be no changes in capacity to Sanford anytime soon. There can't be very many venues in college athletics as picturesque as Sanford Stadium with the background of the beautiful Georgia campus. I would be opposed to any changes to the stadium that altered its aesthetic uniqueness. I hope those in charge of making decisions regarding changes would share my perspective ( to some degree anyway). It's good to be a Georgia Bulldog!